A SUPERMARKET has been accused of ‘dragging its feet’ over discussions to relocate a surgery to premises in Wick. Arun Medical Group, which has surgeries in East Preston and Littlehampton, is due to move into part of the planned Enterprise Hub on the supermarket site, in Hawthorn Road. But the NHS and Morrisons has still to sign a legal agreement, with a chief officer at Coastal West Sussex Clinical Commissioning Group accusing Morrisons of being ‘less co-operative’ than hoped. Dr James Walsh, vice- chairman of West Sussex County Council’s health overview and scrutiny committee, said: “I have been putting pressure on the NHS to come up with the goods. They (Morrisons) are dragging their feet with signing the lease with the NHS. Permission for the medical facility was agreed by Arun District Council in August last year. The NHS agreed to draw up a full business case four months later. Rich Hornby, CCG chief financial officer, said: “We absolutely understand the frustrations of patients and the local community, including Dr Walsh, with the length of time it is taking to make the move of Arun Medical Group a reality. Morrisons was granted planning permission for the Wick supermarket in 2012, with a condition to convert adjoining offices into an enterprise hub for small businesses. 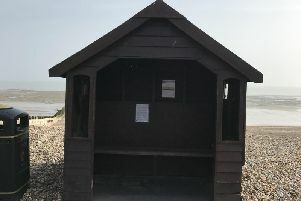 Arun District Council issued a breach of condition notice in October after it opened the store before completing the hub, as required. A frequently asked questions document sent out by the CCG said it was also likely the medical group’s East Preston surgery would be relocated to the new facility under the group’s current plans. The CCG has vowed to keep patients informed of progress.